The lack of diversity at bike industry shows can be daunting for those who aren’t part of the prevailing demographic. I’d estimate that 80 to 90 percent of bike consumers at National American Handmade Bicycle Show, which I went to last month in Salt Lake City, were Caucasian men in their thirties or early forties. Most company reps I spoke with agreed that, for better or for worse, most of their customers fit this mold, because those are the people who are most likely to order high-end, custom-made bikes. Curtis says Mitzi plays an essential role in the business. “She’ll come over and look at something I’m working on and ask about little spots here and there, and what am I thinking for this or that, and will point out things I miss,” he says. “She really does have the eye for detail and keeps me on my toes.” Mitsy also mentioned that they had spoken in the past about Curtis teaching her to weld. He says she’s very patient and would probably make a great welder. I asked Kelly if she ever wanted to build bikes. “Maybe,” she responded. “We were recently discussing hiring a woman to get more involved in the process.” They’re also sponsoring an all-women racing team this year. In addition to the frame and wheel companies, NAHBS also highlighted bike-painting businesses. While many companies were offering custom paint jobs starting around $800, Spray Bikes had the clever, cheaper idea of producing special no-drip acrylic paint that allows you to spray paint your own frame with the low price of $16.99 a can. Emily Kachorek is one of the owners of Sacramento-based Squid Bicycles, which makes bikes specifically made to be spray-painted and now serves as Spray Bike’s U.S. rep. A U.S. National Team racer, she recently returned from Japan where she did live demonstrations of bike painting between criterium races. She raced and crashed her teal popsicle-themed bike several times, and the frame still looks beautiful. The highlight of NAHBS for me was speaking with Anne Hed, CEO of Minnesota-based wheel builder HED Cycling. She discussed in length how her partnership with her late husband Steve made the company successful enterprise. In 2014 the Canadian bike manufacturer Cervélo was impressed by HED’s aerodynamic wheels and invited them to design a one-piece carbon-fiber frame. Since his death, Anne has presented an award in his honor at NAHBS each year. She says she sees the same passion that Steve applied to his craft in the new crop of bike builders. “Can you feel that energy?” she asked. I could. 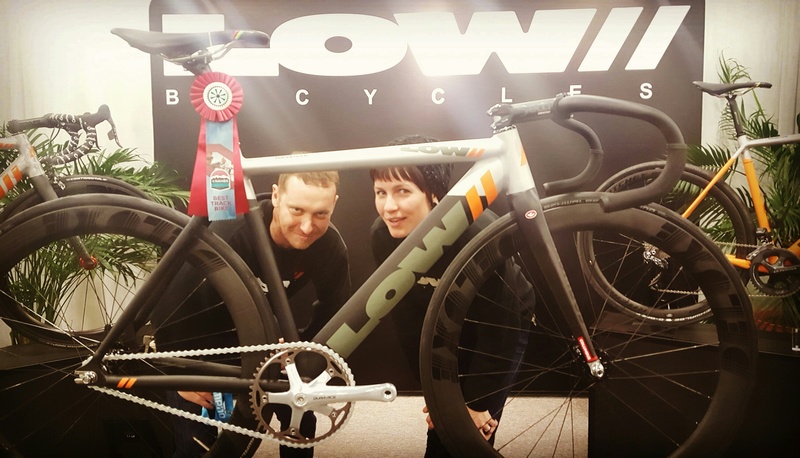 While the community of bike manufacturers at NAHBS is still largely a brotherhood, it’s good to see that dynamic is changing. Women might not always be building the bikes, but they are there making important decisions that can make and break companies as well as barriers. They’re making the small decisions about the details that add up to make bikes appealing, as well as larger decisions about whether a bike gets made at all. Particularly in these smaller bike companies, women are starting to find their place in the cycling industry, and are in turn helping to make cycling appeal to a larger demographic. this article was GREAT! go coco! The president's escalating trade war with China poses a threat to the burgeoning use of e-bikes in the U.S.